Little Women is a 1978 American television miniseries directed by David Lowell Rich and based on the classic 1868 novel of the same name by Louisa May Alcott. The teleplay was written by Suzanne Clauser and is the fifth film adaptation of the Alcott classic, the previous four having been released theatrically in 1917, 1918, 1933 and 1949. The cast includes Susan Dey, Meredith Baxter Birney, Ann Dusenberry, Eve Plumb, Dorothy McGuire, William Schallert, Greer Garson, Robert Young, Richard Gilliland and William Shatner and John de Lancie playing Frank. The three-hour miniseries was produced by Universal Television and originally aired in two parts on NBC on October 2–3, 1978. A brief series followed in 1979, airing from February 8-March 8, 1979. Eve Plumb was among the miniseries cast members who returned (although her character Beth had died in the miniseries, as she had in the original book), playing a cousin of the family called Lissa. The miniseries chronicles the lives and loves of the four March sisters – Jo (Susan Dey), Meg (Meredith Baxter Birney), Amy (Ann Dusenberry) and Beth (Eve Plumb) – growing up in Concord, Massachusetts during the American Civil War. While their father leaves for battle, the sisters must rely on each other for strength in the face of tragedies both large and small. 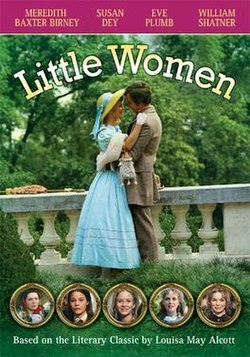 Little Women was released on a 2-disc DVD in region 1 by Koch Vision on October 9, 2007. On August 14, 2012, Entertainment One (eOne) released the miniseries on a single disc DVD. ^ Lambert, David (July 10, 2012). "Little Women - DVDs for the 2-Part Mini-Series with Meredith Baxter, Susan Dey, and Eve Plumb". TV Shows on DVD. CBS Interactive. Archived from the original on June 10, 2017. Retrieved June 7, 2017. This page was last edited on 18 January 2019, at 05:31 (UTC).